An astonishing fable in picture-book format. A girl moving through landscapes of hopelessness and isolation encounters an image of hope on the book's final page. Through the weight of her sorrow, readers conclude, on both intellectual and emotional levels, that living in despair is waiting for hope. Tan's sophisticated mixed-media illustrations include fantasy and dream elements, and subtle symbolism packed together with an array of art techniques ranging from complicated cut-paper collages to Drescher-like paintings, but serious. These complex pictures send visual impressions powerful enough to cause readers to gasp as a new page is revealed. The simple, direct text ("darkness overcomes you" or "sometimes you just don't know what you are supposed to do"), often poetic ("the world is a deaf machine"), serves both as an entryway into the complicated illustrations, and as an enhancement to them. Perhaps too sophisticated in its point of view for some youngsters, this is nonetheless a book of amazing beauty, high quality, and distinguished artistry. "Sometimes the day begins with nothing to look forward to . . . darkness overwhelms you / nobody understands." This picture book for older readers uses spare words and extraordinary paint-and-paper collages to articulate the hopelessness, anxiety, and fear that accompany depression. Each lavish spread follows a young, red-haired girl through wildly imagined, nightmarish landscapes: a city scene, normal except for a hideous giant fish with bloodied eyes; a violent clashing of enormous ships and tidal waves hovering over the girl crouched in a tiny boat. The text is minimal, just a few words per page, but the themes and images are sophisticated: regret over missed opportunities; information overload; the search for identity and meaning. Fragile hope comes in the form of a tiny red leaf that's barely noticeable in each composition, but finally blossoms, at the book's end, into a blazing, glorious tree. Art students, teens, and even adults will be interested in these gripping fantasies, which capture dark fears and depression's terrifying, illogical power. 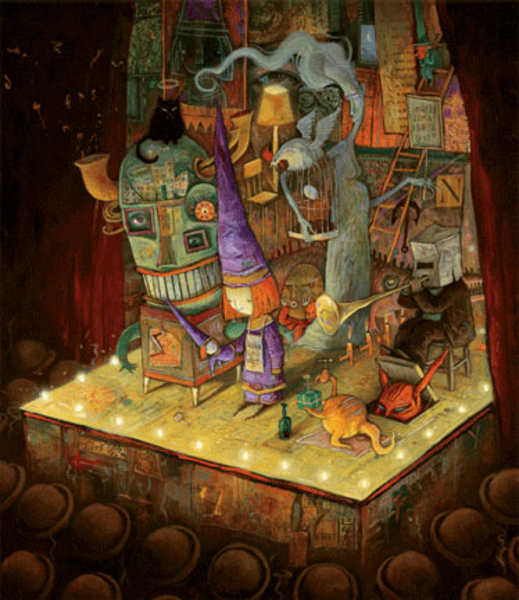 Tan, who won the Best Artist Award at the World Fantasy Convention in 2001, creates an unusual work for the very young that illuminates a dark side too often ignored or unacknowledged in children. A little red-haired girl wakens in her room one morning, "sometimes the day begins / with nothing to look forward to / and things go from bad to worse" Dry leaves that look like spiders are falling in her room, and in the gloomy outside, a huge fish looms over her head. There's a whole page of "sometimes you wait" as we see her counting aimlessly on a surface that becomes a snail's shell. As she wonders, and wanders, the world is very big and complicated. 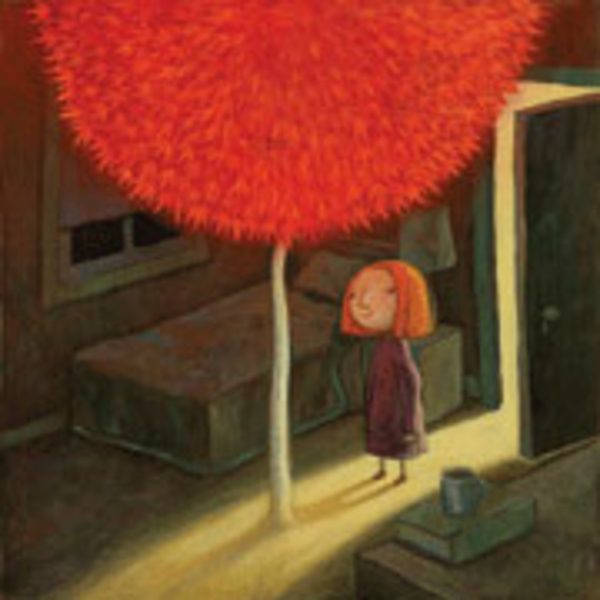 She returns to her room at the end of the day, and the small red leaf framed above her bed sprouts so that on the floor of her room, a red tree appears. Her idea? Her self? Her dreams? Who knows? And it doesn't matter. 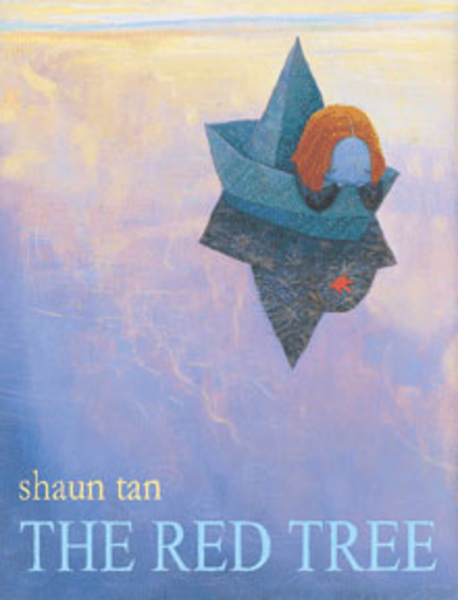 The images are obsessively detailed and full of surreal juxtapositions, and the child, who appears in a tiny boat, trapped in a bottle, and in various Bosch-inspired landscapes, lifts her head and smiles only on the last page, when she sees that flame-colored tree. An imaginative, sad, and ultimately uplifting tale of very few words and extraordinary images.